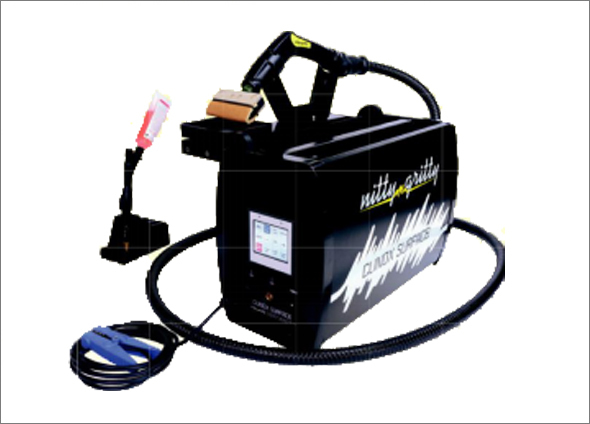 Clinox Surface is the ideal machine for the immediate eco-friendly treatment of TIG, TIG with fi ller metal, MIG/MAG, pulsed-arc MIG, laser, resistance, orbital, and plasma welding as well as for the cleaning of big surfaces. The advanced technology of Clinox Surface, through an immediate electrochemical reaction, ensures pickling, passivation and polishing of any stainless steel weld, irrespective of the fi nishing, without wasting time, without leaving rings, with complete safety for the operator. Clinox Surface, the professional device for companies treating large surfaces, is the only machine fi tted with: patented large torch with electrolyte automatic transmission; vapor blowing system; fast interchange of optional inserts; tank with level-marker for pickling solution; automatic pump to dose liquid; a smaller patented torch with manual dosing and integrated tank able to work simultaneously with the larger torch, thus doubling productivity; brush to reach less accessible points more easily. But thatâ€™s not all: with a 10 centimeters insert and a 6 meter extension cable, Clinox Surface can work directly on surfaces.